Nails 4 Dummies! 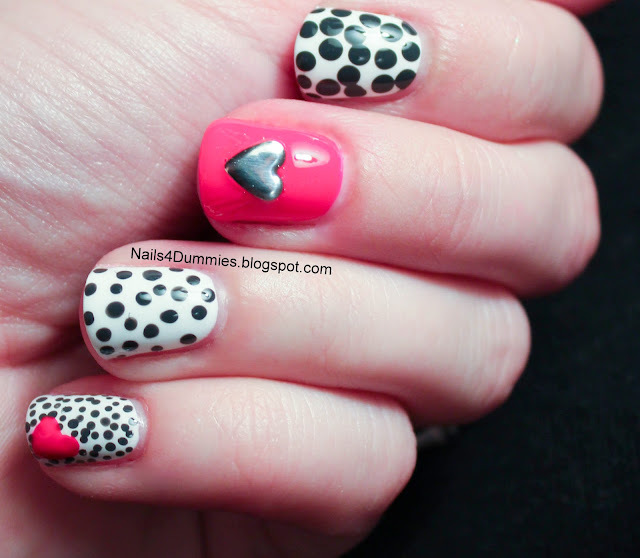 : The Lazy 15 Mani #3 - DOTS!! I can almost hear Nicole (aka Dot) cheering in the background on this one! I really wish I would have had a little more time to work on this one but work has been crazy so I didn't have too much time to think about it. I started with a base of OPI Alpine Snow and then did the dots in China Glaze Concrete Catwalk and an accent finger and a cute little heart in Finger Paints Pink Perspective Neon. I just had to add the little silver heart, I think he's cute, don't you? Please be sure to check out all the other challenge participants, they're all pretty freakin' fabulous! There were so many things I wanted to do here but I just ran out of time, :( I'm starting my water marble early so I can do what I'm envisioning! I love polka dots and hearts!! I always think a heart is a good addition to most manis! Thank you! I'm a little partial to the pinky myself!! Lol, what a great visual!! Thanks!